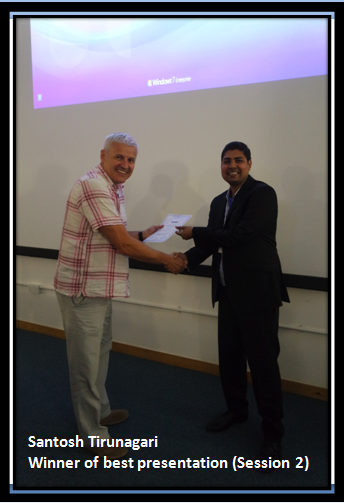 The 2016 IEEE International Conference on Image, Vision and Computing Conference (ICIVC) took place in Portsmouth, UK, from August 3rd to 5th August 2016, held at the Conference Auditorium, University of Portsmouth. The main objective of the ICIVC 2016, is to bring together innovative academics and industrial experts in the field of Image, Vision and Computing to a common forum. I attended this conference in order to present a article entitled: “Can DMD obtain Scene Background in Color?” which is available at https://arxiv.org/pdf/1607.06783.pdf. This is an excellent opportunity because this three-day conference brought together various academics working particularly in the field of computing. Therefore, this provided me with an interactive and friendly platform to present my work, discuss my work with fellow PhD students. The main track of the Conference was composed of three types of session, namely: 1) Oral presentation sessions (1,2), 2)Plenary session 3) keynote session. Keynote and plenary Speakers in ICIVC 2016 included Prof. Ezendu Ariwa (University of Bedfordshire, UK), Dr. Branislav Vuksanovic (University of Portsmouth, Portsmouth, UK), Prof. Jenny Benois, (University of Bordeaux, France), Dr. Hui Yu (University of Portsmouth, UK) and Dr. Huseyin Seker, The University of Northumbria at Newcastle, UK. My presentation was in session 2 and Dr. Branislav Vuksanovic was the chair. My presentation was selected as the best presentation from session 2 and was awarded a certificate at the end of this session. Congratulations to Santosh! Well done!